Variant: Kira 32SERT (Rough Terrain), two extra wheels on the wingtips. Range: 2200km (500 fuel, Mach 0.85, 7000m, 0.06 fuel flow). Special abilities: STOL, configurable landing gear. Mass tanks full: 12.434t (RT: 12.464t). Landing speed: 35m/s (throttle at 26%, tanks full); 32m/s (throttle at 23%, 10% fuel). The Kira has the advantage of ease of control, never failing you and impossible to stall. Pilots may choose to take off and land with either a tricycle or taildragger configuration, or both if they’re nervous or expect a rough landing. This technologically advanced plane has its price and needs more maintenance than others in their class. This is offset by its low fuel consumption and excellent safety features. Also reducing running costs is its ability to STOL, burning less fuel during take off and having less wear on the brakes after touchdown. Another advantage is the fact this plane uses no custom made parts but proven, reliable technology. All flight test were done without SAS except economy tests during which Pilot Assistant was used. Take off: Choose take off configuration, (AG9) toggles taildragger, (AG0) toggles tricycle (double tap first time). Toggle flaps, start engine and go full power. Do not switch on SAS and do not touch the controls! When it’s in the air, let it pitch up to 45 degrees, then retract flaps. It will gently pitch down until just above the horizon. After that, the pilot takes control of the yoke. Normal flight: center of mass shift is negligible during fuel burn. The plane has a tendency to pitch up at high speeds and low altitude. If flying without SAS, trim needs to be used. Never extend the flaps at speeds higher than 50m/s! You and your passengers are not wearing G-suits! Landing: Advice is to land in taildragger configuration, to reduce the risk of tailstrike. Max pitch during landing in tricyle mode: 5 degrees. Best way to slow down for landing is to lower both landing gear sets and/or to use the thrust reverser (AG3). 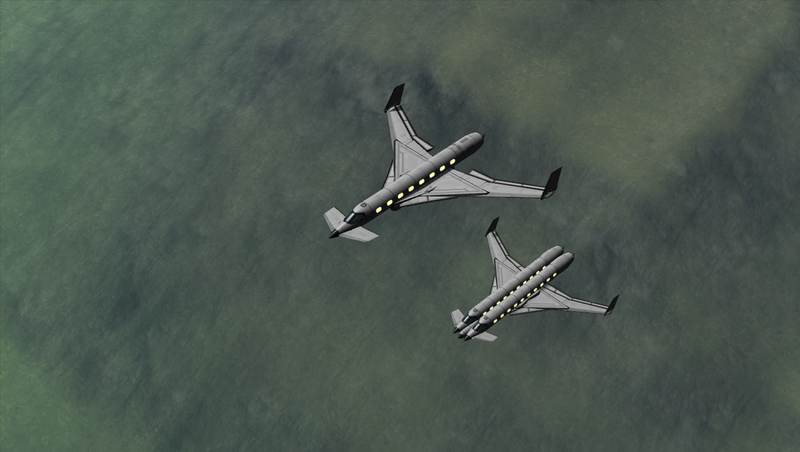 After speed has dropped below 45m/s, the flaps can be extended. Landing without SAS is suggested, for improved feedback. Emergency landing (engine failure or fuel starvation): lower both landing gear sets (mandatory! ), extend flaps. Try to maintain at least 37m/s during descent. Just above the ground, pull on the stick.